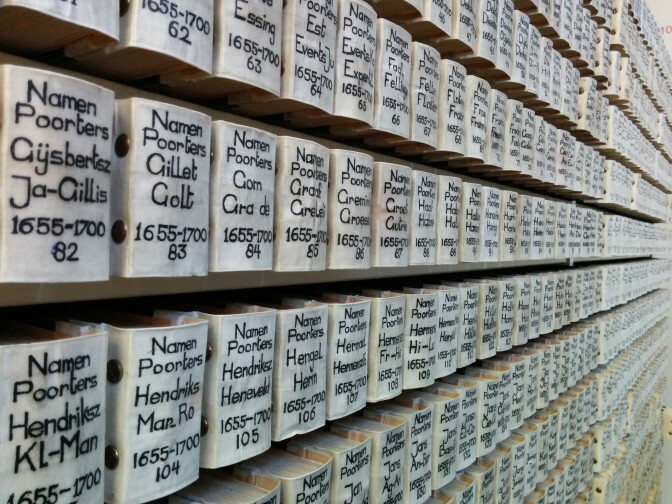 A card catalog created by volunteers in an archive that indexes a series of records. In some cases, these hand-written or typed indexes have been scanned and can be found online. If you’re browsing a register that is not full-text searchable, check the first and last pages for an index, or look in the finding aid whether another call number has an index for the series. You can also contact the local archivist to ask if they know of any contemporary indexes that may be available. Index of poorterboeken, Amsterdam City Archives. Photo by author.